ප්‍රෂියාව (සැකිල්ල:Audio-de; ලතින්: Borussia, Prutenia; සැකිල්ල:Lang-lv; සැකිල්ල:Lang-lt; සැකිල්ල:Lang-pl; පැරණි ප්‍රෂියා බස: Prūsa) was a historic state originating out of the Duchy of Prussia and the Margraviate of Brandenburg. For centuries this state had substantial influence on ජර්මානු and European history. The last capital of the state of Prussia was Berlin. The name ප්‍රෂියාව derives from the Old Prussians, a බෝල්ටික් people related to the Lithuanians and Latvians. In the 13th century, "Old Prussia" was conquered by the Teutonic Knights. In 1308 Teutonic Knights conquered the formerly Polish region of Pomerelia with Gdańsk (Danzig). Their monastic state was mostly Germanized through immigration from central and බටහිර ජර්මනිය and in the south it was Polonized by settlers from Masovia. After the Second Peace of Thorn (1466) Prussia was split into the western Royal Prussia, a province of Poland, and the eastern part, since 1525 called Duchy of Prussia, a fief of the Crown of Poland up to 1657. The union of Brandenburg and the Duchy of Prussia in 1618 led to the proclamation of the Kingdom of Prussia in 1701. Prussia attained its greatest importance in the 18th and 19th centuries. During the 18th century, it became a great European power under the reign of Frederick the Great (1740–1786). During the 19th century, Chancellor Otto von Bismarck pursued a policy of uniting the German principalities into a "Lesser ජර්මනිය" which would exclude the Austrian Empire. The Kingdom of Prussia dominated northern ජර්මනිය politically, economically, in population, and was the core of the unified North German Confederation formed in 1867, which became part of the German Empire or Deutsches Reich in 1871. With the end of the Hohenzollern monarchy in ජර්මනිය following පළමුවන ලෝක යුද්ධය, Prussia became part of the Weimar Republic as a free state in 1919. It effectively lost this status in 1932 following the Preußenschlag decree of Reich Chancellor Franz von Papen; Prussia as a state was abolished de facto by the Nazis in 1934 and de jure by the Allies of දෙවන ලෝක යුද්ධය in 1947. Since then, the term's relevance has been limited to historical, geographical, or cultural usages. Suum cuique ("to each, his own"), the motto of the Order of the Black Eagle created by King Frederick I in 1701, was often associated with the whole of Prussia. The Iron Cross, a military decoration created by King Frederick William III in 1813, was also widely associated with the country. [තහවුරු කරන්න] The region, originally populated by Baltic Old Prussians who were Christianised, became a preferred location for immigration by (later mainly Protestant) Germans (see Ostsiedlung), as well as Poles and Lithuanians along the border regions. Before its abolition, the territory of the Kingdom of Prussia included the provinces of West Prussia, East Prussia, Brandenburg, Saxony (including most of the present-day state of Saxony-Anhalt and parts of the state of Thuringia in ජර්මනිය), Pomerania, Rhineland, Westphalia, Silesia (without Austrian Silesia), Lusatia, Schleswig-Holstein, Hanover, Hesse-Nassau, and a small detached area in the south Hohenzollern, the ancestral home of the Prussian ruling family. The land that Teutonic Prussia occupied was flat and covered with rich soil. The land was perfectly suited to the large-scale raising of wheat. The rise of early Prussia was based on the raising wheat and selling that wheat abroad. Teutonic Prussia became known as the "bread basket of Western Europe" (in German, Kornkammer, or granary). The port cities of Stettin(Szczecin) in Pomerania, Danzig (Gdansk} in Prussia, Riga in Livonia, Koenigsberg (Kaliningrad) and Memel (Klaipėda) rose on the back of this wheat production. Wheat production and trade brought Prussia into close relationship with the Hanseatic League during the period of time from 1356 (official founding of the Hanseatic League) until the decline of the League in about 1500. Although Prussia was dominated by Protestant Germans (Lutherans along with some Reformed), it contained millions of Catholics in the west and in Poland. East Prussia's southern region of Masuria was largely made up of Germanised Protestant Masurs. There were substantial Catholic populations in the Rhineland and parts of Westphalia. Also West Prussia, Warmia, Silesia, and the Province of Posen had predominantly Catholic populations. In 1871, approximately 2.4 million Poles lived in Prussia, constituting the largest minority. Other minorities were Jews, Danes, Frisians, Kashubians (72,500 in 1905), Masurians (248,000 in 1905), Lithuanians (101,500 in 1905), Walloones, Czechs and Sorbs. As a result of the Treaty of Versailles in 1919 the Second Polish Republic was granted not only these two areas, but also areas with a German majority in the Province of West Prussia. After දෙවන ලෝක යුද්ධය, East Prussia, Silesia, most of Pomerania, and the eastern part of Brandenburg were annexed by either the Soviet Union or Poland. The Prussian Homage, Jan Matejko. After admitting the dependence of Prussia to the Polish crown, Albert of Prussia receives Ducal Prussia as a fief from King Sigismund I the Old of Poland in 1525. In 1211 Andrew II of Hungary granted Burzenland in Transylvania as a fiefdom to the Teutonic Knights. In 1225, Andrew II expelled the Teutonic Knights from Transylvania, and they had to transfer to the Baltic Sea. In 1226 Duke Konrad I of Masovia invited the Teutonic Knights, a German military order of crusading knights, headquartered in the Kingdom of Jerusalem at Acre, to conquer the Baltic Prussian tribes on his borders. During 60 years of struggles against the Old Prussians, the order created an independent state which came to control the Old Prussian region. After the Livonian Brothers of the Sword joined the Teutonic Order in 1237 they also controlled Livonia (now Latvia and Estonia) and western Lithuania. The Hanseatic League was officially formed in 1356 as a group of trading cities in northern Europe who came to have a monopoly on all trade leaving the interior of Europe and Scandinavia and on all sailing trade in the Baltic Sea for foreign countries. The businessmen of the interior Sweden, Denmark and Poland came to feel oppressed by the Hanseatic League. The Knights were nominally subordinate to the pope and the emperor. Their initially close relationship with the Polish Crown deteriorated completely after they conquered Polish-controlled Pomerelia and Danzig (Gdańsk). Eventually Poland and Lithuania, allied through the Union of Krewo (1385), defeated the Knights in the Battle of Grunwald in 1410 . In 1525, Grand Master Albert of Brandenburg-Ansbach, a member of a cadet branch of the House of Hohenzollern, became a Lutheran Protestant and secularised the Order's remaining Prussian territories into the Duchy of Prussia. This was the area east of the mouth of the Vistula River, later sometimes called "Prussia proper". For the first time, these lands came into the hands of a branch of the Hohenzollern family. (The Hohenzollern dynasty had ruled the Margraviate of Brandenburg to the west, a German state centered on Berlin, since the 15th century.) Furthermore, with his renunciation of the Order, Albert could now marry and produce offspring. Brandenburg and Prussia were unified two generations later. Anna, granddaughter of Albert I and daughter of Duke Albert Frederick (reigned 1568–1618), married her cousin Elector John Sigismund of Brandenburg. Upon the death of Albert Frederick in 1618, who died without male heirs, John Sigismund was granted the right of succession to the Duchy of Prussia, which was still a Polish fief. From this time the Duchy of Prussia was in personal union with the Margraviate of Brandenburg. The resulting state, known as Brandenburg-Prussia, consisted of geographically disconnected territories in Prussia, Brandenburg, and Rhenish lands of Cleves and Mark. Frederick William I became known as the "Great Elector" for his achievements in organizing the electorate, which he accomplished by establishing an absolute monarchy (see absolutism) in Brandenburg-Prussia. Above all, he emphasized the importance of a powerful military to protect the state's disconnected territories, with the Edict of Potsdam opened Brandenburg-Prussia for immigration of Protestant refugees, and he established a bureaucracy to carry out state business efficiently. The state of Brandenburg-Prussia became commonly known as "Prussia", although most of its territory, in Brandenburg, Pomerania, and western ජර්මනිය, lay outside of Prussia proper. The Prussian state grew in splendour during the reign of Frederick I, who sponsored the arts at the expense of the treasury. The king died in 1740 and was succeeded by his son, Frederick II, whose accomplishments led to his reputation as "Frederick the Great". As crown prince, Frederick had focused, primarily, on philosophy and the arts. He was an accomplished flute player. in 1740, Prussian troops crossed over the undefended border of Silesia and occupied Schweidnitz. Silesia was the richest province of Habsburg Austria. It signalled the beginning of three Silesian Wars (1740–1763). The First Silesian War (1740–1742) and the Second Silesian War (1744–1745) have, historically, been grouped together with the general European war called the War of Austrian Succession (1740–1748). Holy Roman Emperor Charles VI had died on October 20, 1740. He was succeeded to the throne by his daughter, Maria Theresia. By defeating the Austrian Army at the Battle of Mollwitz on April 10, 1741, Frederick succeeded in conquering Lower Silesia (the northwestern half of Silesia). In the next year, 1742, he conquered Upper Silesia (the southeastern half). Furthermore, in the third Silesian War (usually grouped with the Seven Years War) Frederick won a victory over Austria at the Battle of Lobositz on October 1, 1756. On November 3, 1760 Frederick won another battle—the decisive battle—the Battle of Torgau. With this victories and the overall victory in the Seven Years War, Frederick, allied with Great Britain, Hanover, and Hesse-Kassel, was able to hold the whole of Silesia against a coalition of Saxony, Austria, ප්‍රංශය, and රුසියාව. Voltaire, a close friend of the king, once described Frederick the Great's Prussia by saying "...it was Sparta in the morning, Athens in the afternoon." From these wars onwards the German dualism dominated German politics until 1866. In the last 23 years of his reign until 1786, Frederick II, who understood himself as the "first servant of the state", promoted the development of Prussian areas such as the Oderbruch. At the same time he built up Prussia's military power and participated in the First Partition of Poland with Austria and Russia (1772), an act that geographically connected the Brandenburg territories with those of Prussia proper. During this period, he also opened Prussia's borders to immigrants fleeing from religious persecution in other parts of Europe, such as the Huguenots. Prussia became a safe haven in much the same way that the United States welcomed immigrants seeking freedom in the 19th century . Frederick the Great, the first "King of Prussia", practised enlightened absolutism. He introduced a general civil code, abolished torture, and established the principle that the Crown would not interfere in matters of justice. He also promoted an advanced secondary education, the forerunner of today's German gymnasium (grammar school) system, which prepares the brightest students for university studies. [තහවුරු කරන්න] The Prussian education system was emulated in various countries, including the United States. Prussia took a leading part in the French Revolutionary Wars, but remained quiet for more than a decade due to the Peace of Basel of 1795, only to go once more to war with ප්‍රංශය in 1806 as negotiations with that country over the allocation of the spheres of influence in ජර්මනිය failed. Prussia suffered a devastating defeat against Napoleon Bonaparte's troops in the Battle of Jena-Auerstedt, leading Frederick William III and his family to flee temporarily to Memel. Under the Treaties of Tilsit in 1807, the state lost about one third of its area, including the areas gained from the second and third Partitions of Poland, which now fell to the Duchy of Warsaw. Beyond that, the king was obliged to pay a large indemnity, to cap his army at 42,000 men, and to allow French troops to be garrisoned throughout Prussia, effectively making the Kingdom a French satellite. In response to this defeat, reformers such as Stein and Hardenberg set about modernising the Prussian state. Among their reforms were the liberation of peasants from serfdom, the Emancipation of Jews and making full citizens of them. The school system was rearranged, and in 1818 free trade was introduced. The process of army reform ended in 1813 with the introduction of compulsory military service..
After the defeat of Napoleon in Russia, Prussia quit its alliance with ප්‍රංශය and took part in the Sixth Coalition during the "Wars of Liberation" (Befreiungskriege) against the French occupation. Prussian troops under Marshal Gebhard Leberecht von Blücher contributed crucially in the Battle of Waterloo of 1815 to the final victory over Napoleon. Prussia's reward in 1815 at the Congress of Vienna was the recovery of her lost territories, as well as the whole of the Rhineland, Westphalia, and some other territories. These western lands were to be of vital importance because they included the Ruhr Area, the centre of ජර්මනියේ fledgling industrialisation, especially in the arms industry. These territorial gains also meant the doubling of Prussia's population. In exchange, Prussia withdrew from areas of central Poland to allow the creation of Congress Poland under Russian sovereignty. Prussia emerged from the Napoleonic Wars as the dominant power in ජර්මනිය, overshadowing her long-time rival Austria, which had abdicated the imperial crown in 1806. 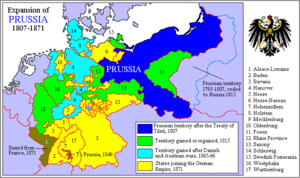 [තහවුරු කරන්න] In 1815 Prussia became part of the German Confederation. The first half of the 19th century saw a prolonged struggle in ජර්මනිය between liberals, who wanted a united, federal ජර්මනිය under a democratic constitution, and conservatives, who wanted to maintain ජර්මනිය as a patchwork of independent, monarchical states, with Prussia and Austria competing for influence. One small movement that signaled a desire for German unification in this period was the Burschenschaft student movement, by students who encouraged the use of the black-red-gold flag, discussions of a unified German nation, and a progressive, liberal political system. Because of Prussia's size and economic importance, smaller states began to join its free trade area in the 1820s. Prussia benefited greatly from the creation in 1834 of the German Customs Union (Zollverein), which included most German states but excluded Austria. In 1848 the liberals saw an opportunity when revolutions broke out across Europe. Alarmed, King Frederick William IV agreed to convene a National Assembly and grant a constitution. When the Frankfurt Parliament offered Frederick William the crown of a united ජර්මනිය, he refused on the grounds that he would not accept a crown from a revolutionary assembly without the sanction of ජර්මනියේ other monarchs. In 1862 King Wilhelm I appointed Otto von Bismarck as Prime Minister of Prussia. Bismarck was determined to defeat both the liberals and conservatives and increase Prussian supremacy and influence among the German states. There has been much debate as to whether Bismarck actually planned to create a united ජර්මනිය when he set out on this journey, or whether he simply took advantage of the circumstances that fell into place. Certainly his memoirs paint a rosy picture of an idealist, but these were written with the benefit of hindsight. What is clear is that Bismarck curried support from large sections of the people by promising to lead the fight for greater German unification. He eventually guided Prussia through three wars which together brought William the position of German Emperor. 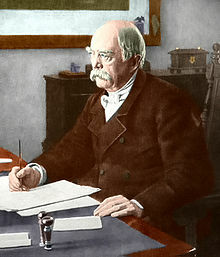 Bismarck realized that the dual administration of Schleswig and Holstein was only a temporary solution, and tensions escalated between Prussia and Austria. The struggle for supremacy in ජර්මනිය then led to the Austro-Prussian War (1866), triggered by the dispute over Schleswig and Holstein. On the side of Austria stood the southern German states (including Bavaria and Württemberg), some central German states (including Saxony), and Hanover in the north; on the side of Prussia were Italy, most northern German states, and some smaller central German states. Eventually, the better-armed Prussian troops won the crucial victory at the battle of Königgrätz under Helmuth von Moltke the Elder. The century-long struggle between Berlin and Vienna for dominance of ජර්මනිය was now over. Bismarck desired Austria as an ally in the future, and so he declined to annex any Austrian territory. But in the Peace of Prague in 1866, Prussia annexed four of Austria's allies in northern and central ජර්මනිය—Hanover, Hesse-Kassel (or Hesse-Cassel), Nassau and Frankfurt. Prussia also won full control of Schleswig-Holstein. As a result of these territorial gains, Prussia now stretched uninterrupted across the northern two-thirds of ජර්මනිය and contained two-thirds of ජර්මනියේ population. The German Confederation was dissolved, and Prussia impelled the 21 states north of the Main River into forming the North German Confederation. As a result of the peace negotiations, the states south of the Main remained theoretically independent, but received the (compulsory) protection of Prussia. Additionally, mutual defense treaties were concluded. However, the existence of these treaties was kept secret until Bismarck made them public in 1867, when ප්‍රංශය tried to acquire Luxembourg. The controversy with the Second French Empire over the candidacy of a Hohenzollern to the Spanish throne was escalated both by ප්‍රංශය and Bismarck. With his Ems Dispatch, Bismarck took advantage of an incident in which the French ambassador had approached William. The government of Napoleon III, expecting another civil war among the German states, declared war against Prussia, continuing Franco-German enmity. Honouring their treaties, however, the German states joined forces and quickly defeated ප්‍රංශය in the Franco-Prussian War in 1870. Following victory under Bismarck's and Prussia's leadership, Baden, Württemberg, and Bavaria — which had remained outside the North German Confederation — accepted incorporation into a united German Empire. The empire was a "Lesser German" solution (in German, "kleindeutsche Lösung") to the question of uniting all German-speaking peoples into one state, because it excluded Austria, which remained connected to Hungary and whose territories included non-German populations. On 18 January 1871 (the 170th anniversary of the coronation of King Frederick I), William was proclaimed "German Emperor" (not "Emperor of ජර්මනිය") in the Hall of Mirrors at Versailles outside Paris, while the French capital was still under siege. The two decades after the unification of ජර්මනිය were the peak of Prussia's fortunes, but the seeds for potential strife were built into the Prusso-German political system. The constitution of the German Empire was a slightly amended version of the North German Confederation's constitution. Officially, the German Empire was a federal state. In practice, Prussia's relationship with the rest of the empire was somewhat confusing. The Hohenzollern kingdom included three-fifths of the German territory and two-thirds of its population. The Imperial German Army was, in practice, an enlarged Prussian army, although the other kingdoms (Bavaria, Saxony, and Württemberg) retained their own armies. The imperial crown was a hereditary office of the House of Hohenzollern, the royal house of Prussia. The prime minister of Prussia was, except for two brief periods (January–November 1873 and 1892–94), also imperial chancellor. [තහවුරු කරන්න] But the empire itself had no right to collect taxes directly from its subjects, the only incomes fully under federal control were the customs duties, common excise duties, and the revenue from postal and telegraph services. While all men above age 25 were eligible to vote in imperial elections, Prussia retained its restrictive three-class voting system. This effectively required the king/emperor and prime minister/chancellor to seek majorities from legislatures elected by two completely different franchises. In both the kingdom and the empire, the original constituencies were never redrawn to reflect changes in population, meaning that rural areas were grossly overrepresented by the turn of the century. As a result, Prussia and the German Empire were something of a paradox. Bismarck knew that his new German Reich was now a colossus out of all proportion to the rest of the continent. With this in mind, he declared ජර්මනිය a satisfied power, using his talents to preserve peace, for example at the Congress of Berlin. Bismarck had barely any success in some of his domestic policies, such as the anti-Catholic Kulturkampf, but he also had mixed success on ones like Germanization or expulsion of Poles of foreign nationality (Russian or Austro-Hungarian). Frederick III was emperor for just 99 days in 1888 upon the death of his father. At age 29, William became Emperor William II after a difficult youth and conflicts with his British mother. He turned out to be a man of limited experience, narrow and reactionary views, poor judgment, and occasional bad temper, which alienated former friends and allies. Almost all of ජර්මනියේ territorial losses, specified in the Treaty of Versailles, were areas that had been part of Prussia: Eupen and Malmedy to Belgium; North Schleswig to Denmark; the Memel Territory to Lithuania; the Hultschin area to Czechoslovakia. Many of the areas which Prussia had annexed in the partitions of Poland, such as the Provinces of Posen and West Prussia, as well as eastern Upper Silesia, went to the Second Polish Republic. Danzig became the Free City of Danzig under the administration of the League of Nations. Also, the Saargebiet was created mainly from formerly Prussian territories. East Prussia became an exclave, only reachable by ship (the Sea Service East Prussia) or by a railway through the Polish corridor. In contrast to its prewar authoritarianism, Prussia was a pillar of democracy in the Weimar Republic. This system was destroyed by the Preußenschlag ("Prussian coup") of Reich Chancellor Franz von Papen. In this coup d'état, the government of the Reich unseated the Prussian government on 20 July 1932, under the pretext that the latter had lost control of public order in Prussia (during the Bloody Sunday of Altona, Hamburg, which was still part of Prussia at that time). Papen appointed himself Reich commissioner for Prussia and took control of the government. The Preußenschlag made it easier, only half a year later, for Adolf Hitler to take power decisively in ජර්මනිය, since he had the whole apparatus of the Prussian government, including the police, at his disposal. Because the Reichstag building had been set on fire a few weeks earlier, the new Reichstag was opened in the Garrison Church of Potsdam on March 21, 1933 in the presence of President Paul von Hindenburg. In a propaganda-filled meeting between Hitler and the Nazi Party, the "marriage of old Prussia with young ජර්මනිය" was celebrated, to win over the Prussian monarchists, conservatives, and nationalists and induce them to vote for the Enabling Act of 1933. In Prussia, this anti-federalistic policy went even further. From 1934 almost all ministries were merged and only a few departments were able to maintain their independence. Hitler himself became formally the governor of Prussia. His functions were exercised, however, by Hermann Göring, as Prussian prime minister. The Prussian lands transferred to Poland after the Treaty of Versailles were re-annexed during දෙවන ලෝක යුද්ධය. However, most of this territory was not reintegrated back into Prussia but assigned to separate Gaue of Danzig-West Prussia and Wartheland. With the end of Nazi rule in 1945 came the division of ජර්මනිය into Zones of Occupation, and the transfer of control of everything east of the Oder-Neisse line, (including Silesia, Farther Pomerania, Eastern Brandenburg, and southern East Prussia), to Poland, with the northern third of East Prussia, including Königsberg, now Kaliningrad, going to the Soviet Union. Today the Kaliningrad Oblast is a Russian exclave between Lithuania and Poland. During the Soviet Army's takeover of eastern ජර්මනිය an estimated ten million Germans fled, were expelled from (or were not able to return) to these territories as part of the Potsdam Agreement and the sanctioned German exodus from Eastern Europe. In the Soviet Zone of Occupation, which became නැගෙනහිර ජර්මනිය in 1949, the former Prussian territories were reorganised into the states of Brandenburg and Saxony-Anhalt, with the remaining parts of the Province of Pomerania going to Mecklenburg-Vorpommern. These states were abolished in 1952 in favour of districts, but were recreated after the fall of the Eastern Bloc in 1990. In the Western Zones of occupation, which became බටහිර ජර්මනිය in 1949, the former Prussian territories were divided up among North Rhine-Westphalia, Lower Saxony, Hesse, Rhineland-Palatinate, and Schleswig-Holstein. Württemberg-Baden and Württemberg-Hohenzollern were later merged with Baden to create the state of Baden-Württemberg. Since the dissolution of the Soviet Union, a small number of ethnic Germans from Kazakhstan have begun to settle in the Kaliningrad exclave of රුසියාව, once northern East Prussia, as part of the migration influx into the area, which was previously a restricted area (closed city). As of 2005, about 6,000 (0.6% of population) ethnic Germans, mostly from other parts of Russia, live there. After German reunification in 1990, a plan was developed to merge the States of Berlin and Brandenburg. Though some suggested calling the proposed new state "Prussia", no final name was proposed, and the combined state would probably have been called either "Brandenburg" or "Berlin-Brandenburg". However this proposed merger was rejected in 1996 by popular vote, achieving a majority of votes only in former West Berlin. ↑ 5.0 5.1 5.2 5.3 Büsch, Otto; Ilja Mieck, Wolfgang Neugebauer (1992). Otto Büsch. ed (Germanයෙන්). Handbuch der preussischen Geschichte. 2. Berlin: de Gruyter. පිටු 42. ISBN 978-3-11-008322-4. ↑ Robert S. Hoyt & Stanley Chodorow, Europe in the Middle Ages p. 629. ↑ H. W. Koch, A History of Prussia pp. 100-102. ↑ Robert A. Kahn, A History of the Habsburg Empire 1526-1918 (1974) p. 96. ↑ Asprey, Frederick the Great: the Magnificent Enigma, pp. 195-208. ↑ Hermann Kinder & Werner Hilgermann, The Anchor Atlas of World History: Volume 1 (1974) pp. 282-283. ↑ James K. Pollock & Homer Thomas, ජර්මනි: In Power and Eclipse (1952) pp. 297-302. ↑ Marshall Dill, Jr., ජර්මනි: A Modern History (1970) p. 39. ප්‍රෂියාව හා සබැඳි මාධ්‍ය විකිමාධ්‍ය කොමන්ස් හි ඇත. (ජර්මන්) Constitutional deed for the Prussian state ("Imposed Constitution" – December 5, 1848) (full text). (ජර්මන්) Constitutional deed for the Prussian state ("Revised Constitution" – January 31, 1850) (full text). මේ පිටුව අන්තිමට සැකසුවේ 10 මාර්තු 2016 දින දී, 23:08 වේලාවෙහිදීය.